Ernest Browne has been running from his past for over 50 years. He is a proud member of the 1967 Winston-Salem State men’s basketball team that holds acclaim as the first historically black college or university (HBCU) to capture an NCAA championship. Yet, with all that glory, he can still recall with painful specificity that practice where all he did was run for over two hours. By himself. His legendary no-nonsense coach, Clarence “Big House” Gaines, was looking to make an example of Browne, who, along with teammate Earl “The Pearl” Monroe, had arrived late to a game after a longer-than-estimated road trip. It was that kind of approach that led Winston-Salem State to the highest of heights, becoming the first black college team to ever win an NCAA national title when it defeated Missouri State 77-74 in the ’67 title game. 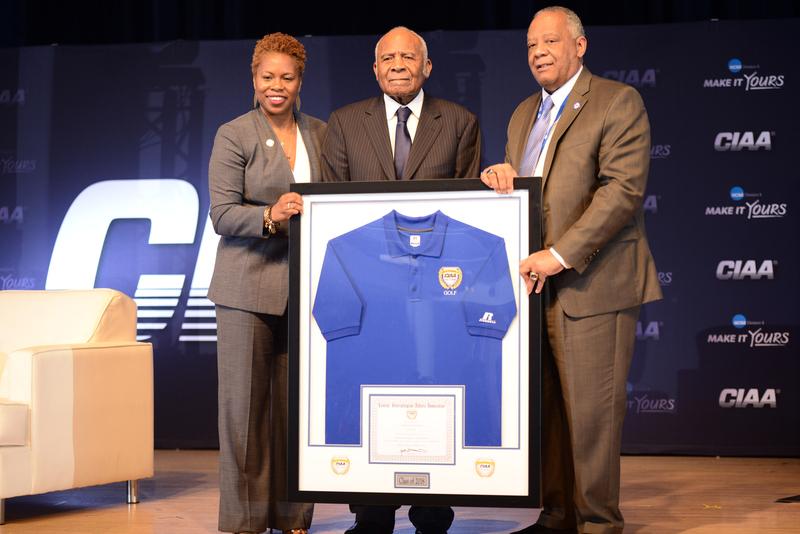 Browne and a few of his former teammates — including William English, David Green, Frank Hadley Jr., Vaughn Kimbrough, John Lathan, Allen McManus, Monroe, James Reid, Eugene Smiley, Steve Smith, Johnny Watkins and Donald Williams — were enshrined in the 2018 CIAA Hall of Fame class, as part of CIAA Tournament Week festivities, on their 50th anniversary. Other CIAA legends inducted included Kermit Blount, former head football coach and star quarterback of the Winston-Salem State University Rams; Ben Coates, former football standout at Livingstone College; Raymond McDougal, former head golf coach at Fayetteville State University; and Dorothy Cowser Yancy, former president of Shaw University and Johnson C. Smith University. Each awardee, though with different experiences through the decades, shares an appreciation for history and for mentors who helped them along the way. “I had four older brothers and five younger sisters,” said Blount, now the head football coach at Johnson C. Smith University, who guided Winston-Salem State to the 1977 and ’78 CIAA championships and was named a Black College All-American in ’78. Coates, the former three-year football letterman at Livingstone College, where he amassed 103 receptions for 1,268 yards and 18 touchdowns, understood that he carried the torch for his school wherever he went — and whether others knew of his school or not. “Coming from a Division II school when I first got to [the NFL], most guys wanted to hang out, but I made sure I kept that playbook in front of me,” said Coates, who was drafted in the fifth round by the New England Patriots, with whom he spent nine seasons (1991-99) before finishing his professional career with the Baltimore Ravens (2000-01 season). “I wanted to put Livingstone and the CIAA on the map,” added Coates, who played 158 NFL games, amassing 499 receptions and 50 touchdowns, still ranking him second on the Patriots’ all-time career touchdowns list. Raised on a farm in Alabama, Yancy recalled she decided to attend Johnson C. Smith University in the second grade after she heard her teacher, Mrs. Simmons, playing the piano. When the young student asked her teacher where she learned to play the piano, the teacher told her Johnson C. Smith, and right then her decision was made. “I grew up on a farm with parents with unbelievable work ethic,” said Yancy, who ultimately became the president at Johnson C. Smith University (1994-2008) and at Shaw University (2009-10; 2011-13). 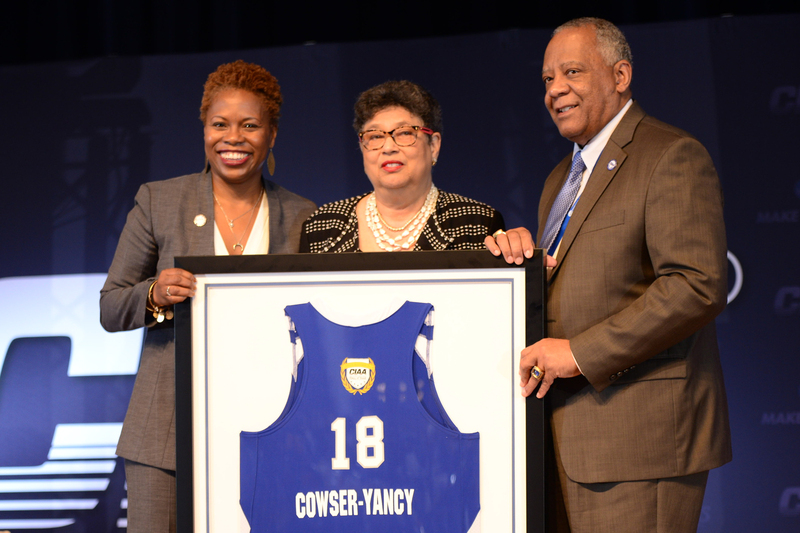 “My dad worked the farm during the day and had a regular job as well; that’s what I saw, and that’s what made me,” continued the first female university president in the CIAA. No stranger to challenges that HBCU have faced and continue to face, Yancy challenged the room filled with alumni and presidents from other institutions to change the old paradigm. Neal was like a point guard running the floor in his interviews of inductees. Neal tossed up questions, and Yancy and others would catch them one-handed and flush them home with stories, keeping a wanting audience in awe. When asked why Browne was the only one punished to run for the entire practice after their ill-fated trip home — and not Monroe, who drove — Browne said Gaines answered his query with a question of his own: “I thought you were smarter than that” — pointing to Monroe’s 41.5 points per game.